Did you know the traditional Campbell’s green bean casserole has been served at the holiday table for 56 years? Yes, 56 years! That means it’s older than Leave it Beaver, Bonanza and the Twilight Zone! You can appreciate that the birth of the green bean casserole in 1955 makes it an American cult dish. I know it’s one of those dishes that we’ve all been eating since we were kids. Thanksgiving is probably the only day of the year that it graces your dinner table. I was thinking there has to be another way to serve this beautiful bean, sans the processed can of soup. I’ve oven roasted green beans here for a healthy twist – not a replacement for your grandmother’s casserole, but let’s just call this bean option number two. Change is good and in this case, very tasty. Preheat your oven to 425 degrees. 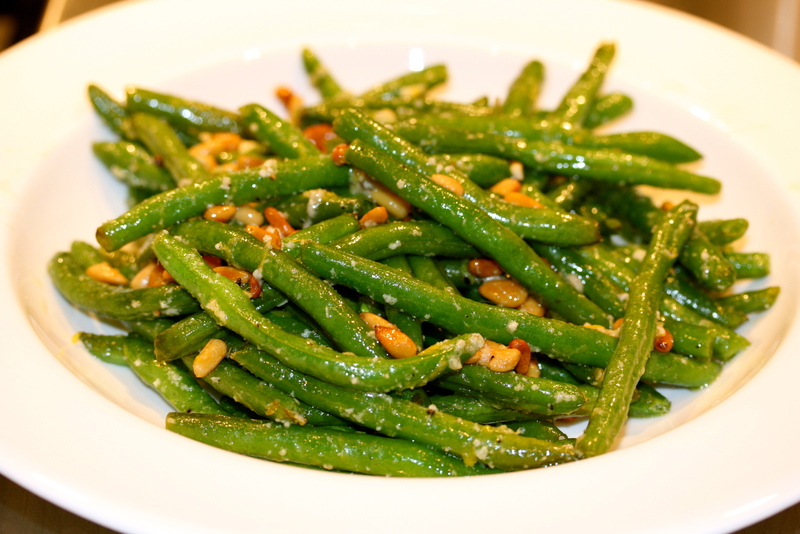 Place the green beans on a metal rimmed sheet pan. Drizzle over the olive oil and season with a little kosher salt and pepper. Toss together and spread out the beans on the pan. Roast in the oven for about 10 minutes. The green beans should be bright green and still have a little crunch. No mushy grey-green beans here! Meanwhile, while the green beans are roasting, zest half a lemon, mince the garlic and toast your pine nuts (see below for tips on toasting nuts). Remove the green beans from the oven and transfer to a bowl. Sprinkle over the zest, garlic, pine nuts and parmesan – give a toss and taste for reseasoning. Enjoy! Although there are other methods for toasting nuts, this is what works for me. Spread the nuts out in a single layer on a sheet pan and place in a preheated 375 degree oven for about 5-7 minutes (the toaster oven works great for this). Give them a shake about halfway through and keep a close eye. They can go from perfectly toasted to burnt, fast. You’ll know they are done when they turn slightly golden and you can smell them starting to roast. Thanks! It’s really yummy and super simple to make, too.